Angelo Cimaglio first appears in the Painesville, Ohio, area in the 1920’s. Angelo Cimaglio, son of Paolo Cimaglio, was born on September 10, 1870, at Casalciprano, Italy. He married first, Maria Colillo. He married second, Maria Antonia Pasquarelli, daughter of Giovanni Pasquarelli and Angela Mezzanotte. 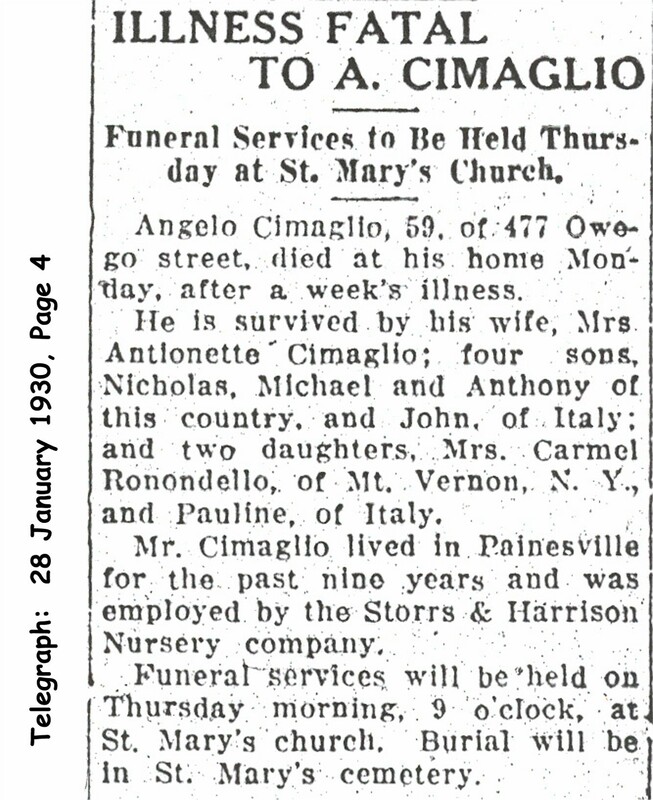 Angelo died on January 27, 1930, at his home, 477 Owego Street, Painesville, Lake County, Ohio, at age 59. His body was interred at St. Mary Cemetery at Painesville Township, Lake County, Ohio. Angelo Cimaglio immigrated to the United States in 1895. He returned to Italy in 1897. He re-entered the United States on April 6, 1898, returning to New York City. He spent a few years in New York City, and returned to Italy. He returned to New York City again, in 1909. He visited Italy in 1911, and apparently, married Antoinette Pasquarelli. Angelo Cimaglio is shown as re-entering the United States on May 15, 1912. He was returning to New York City, joining his brother, Filomeno. In 1921, Angelo’s wife, Maria Antonia Pasquarelli, and their children, Nicola and Michele immigrated to the United States. According to the passenger ship manifest, they were joining Mr. Cimaglio in Willoughby, Ohio. Since Angelo and Antoinette’s son, Anthony Cimaglio was born in Providence, Rhode Island, they may not have lived in Willoughby, Ohio. Angelo Cimaglio ws employed by the Storrs and Harrison Nursery Company from 1930 until his death. 1. Carmella Cimaglio was born before 1909. 2. Palma Cimaglio was born before 1909. 3. Giovanni Cimaglio was born about 1909. 2. Michele Cimaglio was born on September 24, 1914, at Casalciprano, Italy. He married Angeline Manini, daughter of Antonio Manini and Giacinta DeLuca, on November 18, 1939. Michele died on January 18, 2003, at Alter Care of Mentor, Mentor, Lake County, Ohio, at age 88.